Home About Universe Info Physics Quantum Entanglement: Who is Right Einstein or Bohr? Quantum Mechanics is the one of most successful theory ever discovered by physicists and there is no doubt about that, but physicists are still arguing about what it means? What do Quantum Mechanics tell us about the nature of reality? Quantum mechanics make almost the all the stuff of modern age, even the computer or mobile you are using to read this article is the result of quantum mechanics but quantum mechanics is still deeply mysterious. Answers to the basic questions asked by Albert Einstein back in 1920 are still unexplainable. For Neils Bohr measurement changes everything. He believed that before you measured or observed the particle its characteristics were uncertain. For example an electron in the double slit experiment, before the detector at the back pain points its location on the screen, it could be almost anywhere with a whole range of possibilities until the moment you observe it. According to Bohr’s approach to quantum mechanics when you measure a particle, the act of measurement forces the particle to relinquish all the other places where it could have been and select one definite location. So the act of measurement forces the particle to make that choice. Neils Bohr accepted that the nature of reality was inherently fuzzy but not Einstein. Einstein believed in certainty not just when something is measured to look at but all the time. As Einstein said I like to think that moon is there even when I am not looking at it. Einstein was convinced that something was missing from quantum mechanics. Something that would help you locate the particle in the same place even when you are not looking. Despite Einstein’s arguments Neils Bohr remained unmoved. In 1935 Einstein thought that he had found something that can fill the gap in quantum mechanics. He thought it would help in completing the quantum theory. It is called Entanglement. The most bizarre, the most absurd, the craziest and the most ridiculous prediction that quantum mechanics makes is Entanglement. 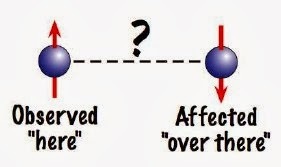 Two particles can become entangle if they are closed together then their properties becomes linked. Remarkably quantum mechanics says that even if you separate those particle sending them in the opposite direction, then they will still remain entangle. An electron spins as with other quantum qualities and is generally completely fuzzy and uncertain until the moment you measured it and when you do, you will either find it spins clockwise or counter clockwise. According to quantum entanglement, measuring one particle will affect its other entangle particle no matter how far that is, even if one is on earth and the other is on the moon. For Einstein that kind of weird long range connection between particles was so liturgist, he called it spooky. Spooky action at a distance. There is no way that the particles can communicate each other at very long distances so it is completely bizarre. Einstein agreed that entangle particles could exist, he insisted that these entangle particles are like gloves. If you have a pair of gloves and you pack each glove in two different boxes and send these two boxes to two different places and when a person opens the first box can predict that what glove is in another box without looking at it. If he got the right hand glove in the box than the other must be left handed. Einstein thought the same idea applies to entangle particles, whatever the configuration electrons are in, must have been determined when they flew apart. So who was right, Bohr, who said that particles immediately transfer information to others, even across great distances or Einstein, who believed that there was no spooky connection between particles but instead everything was decided well before you look. Northern Irish physicist John Bell puts this question under experiments. A machine was designed to test a large number of particles. After different experiments, it turned out that Bohr was true. Measuring one particle suddenly effects the other as the space between them even did not exist. Einstein thought that the spooky action was impossible but experimental results showed that it was reality, the spooky action exists.